Gastroenteritis is an infection in the stomach and intestines that causes nausea, vomiting and diarrhea. Gastroenteritis related to food is commonly the result of food poisoning. A food allergy can cause symptoms similar to gastroenteritis, although there is no actual infection. 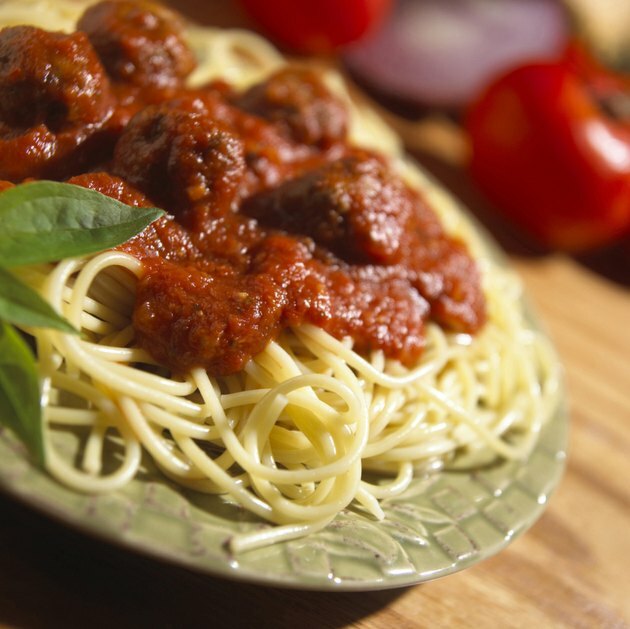 Pasta sauces may contain milk, fish and tomatoes that could trigger an allergic reaction. If you develop stomach pain after eating pasta sauce, you need to see your doctor to determine the cause of your symptoms. Gastroenteritis that develops after eating pasta sauce is most likely caused by food poisoning. After you eat pasta sauce that's contaminated with an infectious organism, the lining of your stomach and intestines will become infected and inflamed. Pasta sauce can become contaminated during the manufacturing process or during the preparation before serving it from contaminated utensils or cookware. If you refrigerate and reheat the pasta sauce multiple times, you're at a greater risk of developing food poisoning. The type of organism that has contaminated the pasta sauce will determine the severity and longevity of the symptoms. Most symptoms will appear within a few hours after you eat contaminated pasta sauce. The most common symptoms of gastroenteritis from food poisoning include nausea, vomiting, abdominal pain, fever, fatigue, loss of appetite, stomach cramps and watery diarrhea. Call your doctor if you notice blood in your vomit or stool, as this may be a sign of a more serious condition. An allergic reaction to one or more of the ingredients in the pasta sauce can cause inflammation in the digestive system. Pasta sauces may contain fish, dairy and tomatoes. These foods can trigger an allergic reaction. If you're allergic to an ingredient in the sauce, your immune system will overreact to the proteins in that ingredient, triggering the production of immunoglobulin E antibodies. These allergy-provoking agents cause the production of histamine in your intestines, which can cause common gastroenteritis symptoms. The main concern with treating gastroenteritis is to maintain proper hydration. Gastroenteritis can cause excessive vomiting and diarrhea, which can deplete the body of essential fluids. Drink more clear liquids and eat foods that are bland and will promote bulk-forming stool, such as white rice, bananas, white bread, plain yogurt and apple sauce. If you notice symptoms of dehydration, such as dry mouth, dry skin and feeling lethargic, call your doctor right away.